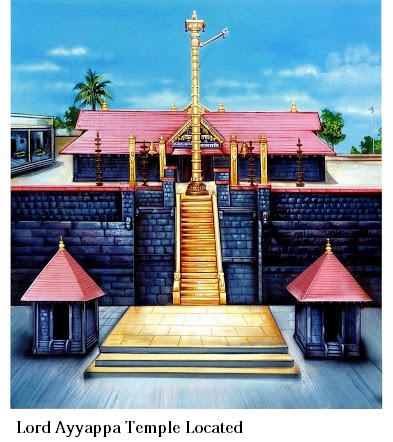 Lord Ayyappa is the presiding deity of Sabarimala temple in Kerala, India. 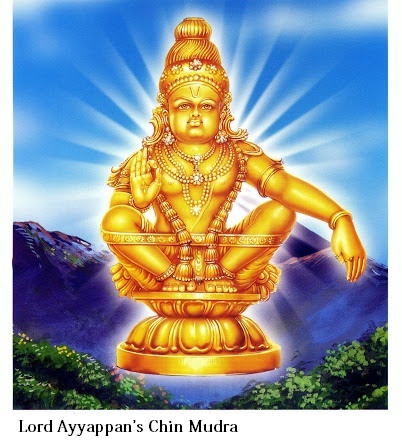 Lord Ayyappa (in Malayalam language pronounced as Ayyappan) is worshipped as a child at Kulathupuzha temple in Kerala and in Achan Kovil temple along with his consorts Pushkala and Poorna and in Sabarimala as an ascetic meditating for the well being of all mankind. The Lord is considered to be the reincarnation of Sree Dharma Sastha referred to in the ancient texts of Hinduism. In Lord Ayyappa, we visualize Lord Shiva (The Lord of Destruction) and Lord Vishnu (The Lord of Sustenance) in a unified form. The word Ayyappa is derived from two words Ayya meaning Vishnu and Appa meaning Shiva. The worship of Lord Ayyappa enunciates the great Advaita principle of Tat Tvam Asi; meaning Thou art That or That is You. 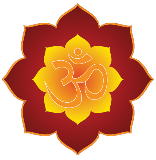 It means you are part of the Universal Soul (Paramatma). It also means that for reaching the Paramatma or Universal Soul you search in yourself i.e the Jeevatma (Life soul present in you). 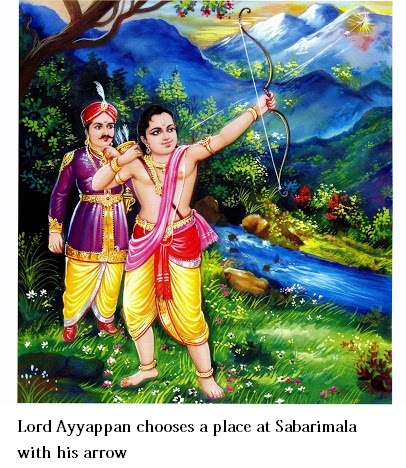 It is because of this concept that in Sabarimala every devotee is addressed as Swami (Lord) or Ayyappan or Malikappuram and the temple is open to all irrespective of his or her religion, caste, creed or colour of the skin. One of the significant rituals performed in the Sabarimala temple is the Neyyabhishekam or pouring of the sacred and pure ghee brought in the Irumudikettu (the double pouched cloth bag carried on the head by the pilgrims visiting Sabarimala) on the idol of Lord Ayyappa. It symbolically means the merging of Jeevatma and Paramatma. 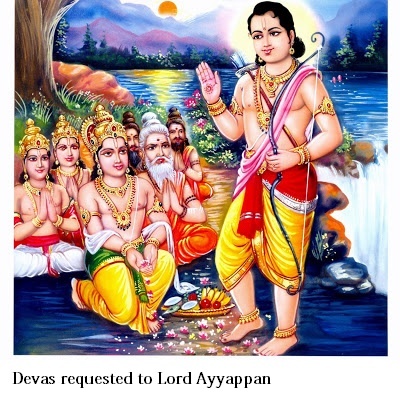 In Hindu religion all great philosophical ideas are presented through mythological stories and in the case of Lord Ayyappa the mythology goes as follows. The asura princess Mahishi was burning up with anger at the dirty trick the Devas had played on her brother the asura king Mahisasura. Blessed with invulnerability to all men, the gods had sent a woman, the goddess Durga, to fight and kill him. Mahishi then performed a fearsome set of austerities, and so surpassed all records in that grim tapasya, that Brahma, The Creator had really no option but to give her a boon to rule the universe and to be invulnerable except to a being that had the combined strength of both Shiva and Vishnu. Since such a person did not exist, she thought she was safe and began the usual asura career of conquest and plunder. The Devas implored Shiva and Vishnu to save them from this catastrophe. When Vishnu had taken on the Kurma Avatar, he also had to manifest himself as Mohini, the enchantress, to save the nectar of immortality from the demons who were not willing to share it with the Devas. If he became Mohini again, then the female Mohini and the male Shiva could have the divine child who would combine their powers and beat Mahishi. 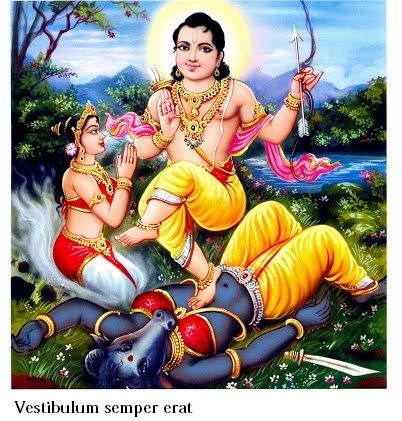 And Sree Dharmasastha was born as the son of Mohini and Shiva. The descendants of Pandya dynasty discarded by Thirumala Naicker Diwan of Raja Vijayanagar, who was then ruling the Pandya Kingdom, comprising of Madurai,Tirunelveli, Ramananthapuram, were living scattered in places like Valliyur, Tenkasi, Shengottah, Achankovil and Sivagiri. At that time, Pandyas were ruling in many parts of Travancore. 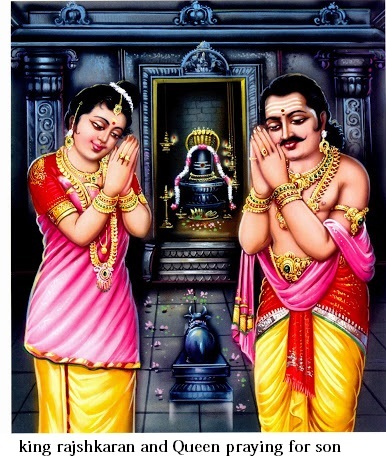 The descendants of Pandya dynasty belonging to Chempazhanattu Kovil, living in Sivagiri were given the right to rule the country of Pandalam, by the King of Travancore eight hundreds years ago. King Rajasekara was the direct descendant of this dynasty. King Rajasekara was very talented, courageous and just in his deeds. People were living happily and prosperously during his regime. However, the king was very unhappy that he had no children and his subjects were also worried that he had no heir to inherit his kingdom. 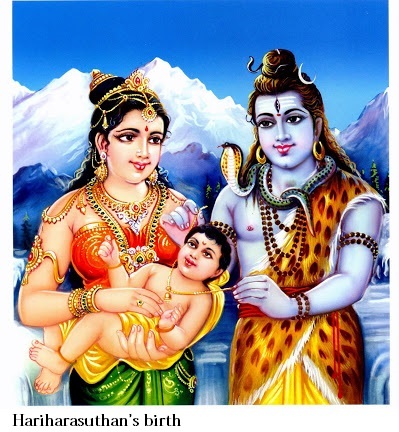 As per the wish of the queen, both of them prayed Lord Shiva for blessing them with a child. Mahishasuran, Son of Ramban, undertook a severe penance (Dhavam). Lord Brahma tried to distract his concentration, but having failed in his attempts, he appeared before the Asura and blessed him with a boon. Mahishasuran asked Lord Brahma to give him a boon by which no man in the earth would be able to kill him, and Lord Brahma conferred the boon on him. Mahishasuran, armed with his boon, began to commit atrocities and murders on the earth and terrorised people. Fearing his wrath, people ran away to far away places. The Devas seeing the atrocities committed by Mahishasuran came to the conclusion that only a divine power could kill him and approached Chandikadevi (Mahishasuramardhini) pleading to put an end to Mahishasura who was misusing the boon given by Lord Brahma. Chandikadevi set out on her mission and killed Mahishasura in a duel, on earth. Mahishi daughter of Karamba, brother of Ramban undertook a severe penance in order to take revenge on the Devas, who were responsible for the death of her husband. 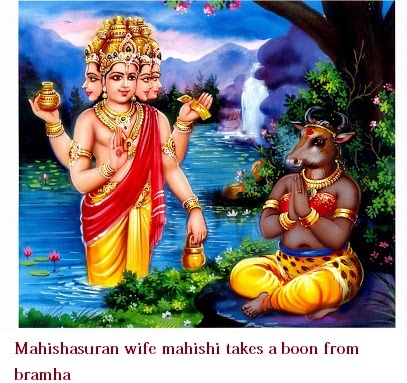 Lord Brahma appeared and offered to confer on Mahishi any boon except that of immortality. 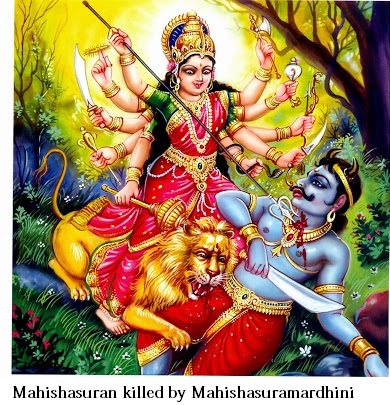 Mahishi asked Lord Brahma to bless her with a boon by which nobody , except the son created out of the union of Vishnu (Hari) and Shiva (Haran), would be able to kill her. 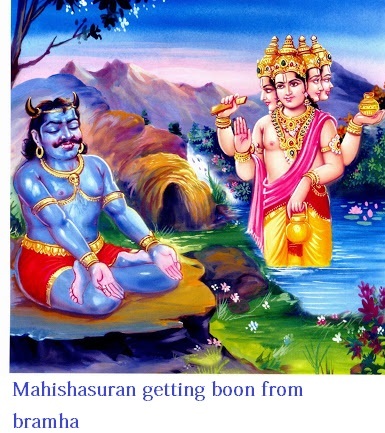 Lord Brahma gave the boon and Mahishi went to Devaloka and started harassing the Devas. 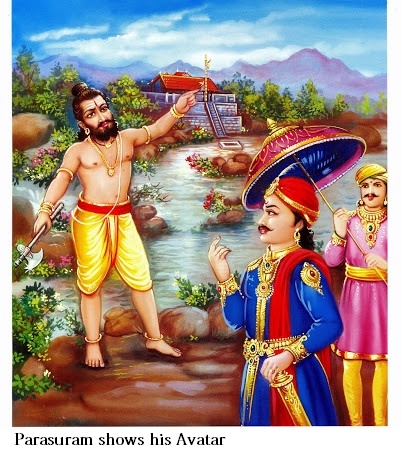 The Devas incurred the wrath of Durvasa Muni who cursed them. 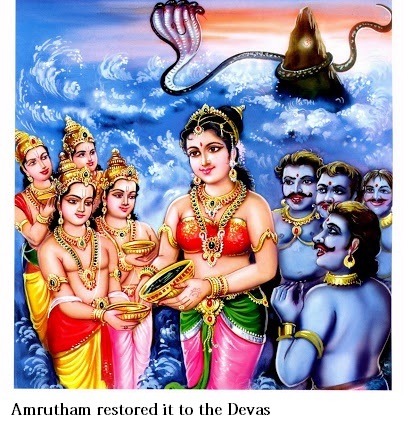 On the advice of Lord Mahavishnu that this curse could be removed only by administering Amrutham taken from Palazhi, the devas took it from the Palazhi, but the Asuras snatched it from them.Lord Mahavishnu in the disguise of Mohini, went to theAsuras and got back the Amrutham and restored it to the Devas. When Lord Shiva, went to see Lord Mahavishnu who was in the guise of a Mohini succumbed to her beauty and out of their union, was born a child, who was name Dharmasastha. Dharmasastha grew at Kailasham. 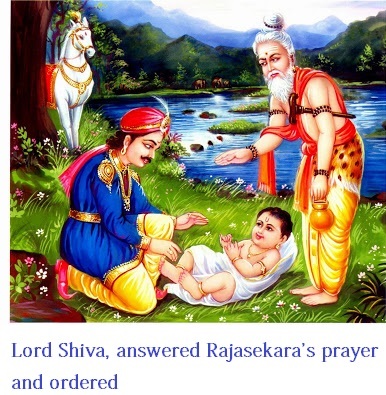 Lord Shiva, answered Rajasekara's prayer and ordered Dharmasastha to take the avathar of Ayyappan . 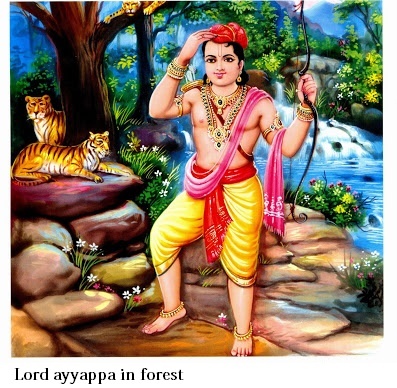 On the day King Rajasekara went for hunting in the forest, Ayyappan took the form of a baby with a golden chain and bell around his neck and placed himself near the Pamba river. While the King was engrossed in his thoughts, a Sanyasi appeared before him and told the King that he need not be afraid of the child and take him to the Palace and that the child belonged to Kshatriya dynasty capable of mitigating all sufferings. The Sanyasi further stated that since the Child had a gold bell around his neck, his name be called "MANIKANDAN" and when the child completed twelve years, the King would know his divine history. After uttering these words, the Sanyasi disappeared. 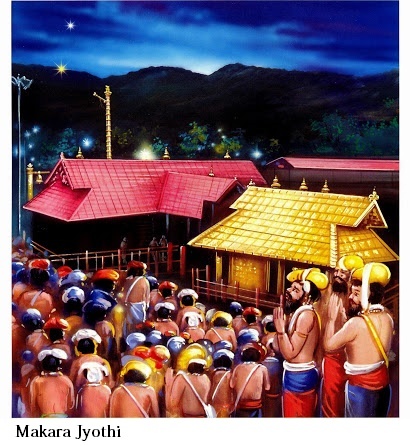 The King of Pandalam was very joyous, he took the child to his Palace and briefed the Queen about the incident. The King and the Queen, having prayed to Lord Shiva, for a child, were very happy that they had been blessed with a child. The people also felt happy that a heir to inherit the Kingdom after the King, has been found. was a divine power and he was blessed for having been given an opportunity to have Manikandan as a student. The Guru further told Manikandan that he had one request to make and that was that his only son who was dumb should be given speech. 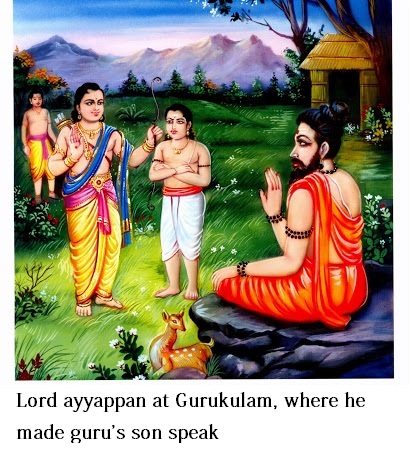 Manikandan called the Guru's son and put his hands on his head and immediately Guru's son had his speech. Manikandan requested the Guru not to reveal this to anyone and went to the Palace. 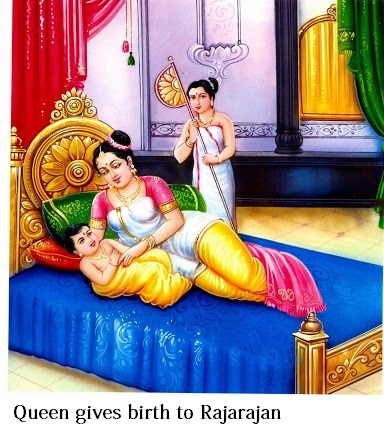 In the meanwhile, the Queen gave birth to a male child and the child was named RajaRajan. 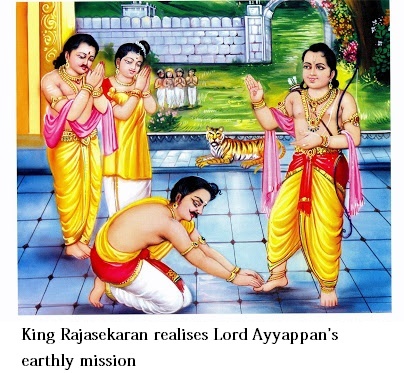 King Rajasekara, impressed with the talents of Manikandan, decided to crown him, treating him as his eldest son. He ordered the Diwan to make arrangements for the same. The Diwan hated this and started devising plans to prevent Manikandan from being crowned to the throne and to annihilate him. He tried various methods including poisoning of food, but failed in all these. However, Manikandan's body bore an injury due to these and ordinary physicians could not cure it. Lastly, Lord Shiva disguising himself as a physician, treated Manikandan's injury and cured him. Having failed in all his attempts to kill Manikandan, the Diwan approached the Queen and told her that she had her own son, it was not correct to crown a person who came from the forest. 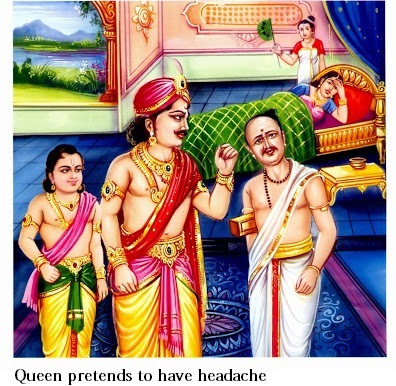 He further told the Queen since Arthasastra itself has justified any misdeed if it was done to extract a good thing, he would suggest that the Queen should pretend as if suffering from severe headache and stomach pain and he would make the physician tell that only a tigress' milk should be brought to cure the Queen and since Manikandan would only go to the forest to bring the milk, he would be in danger from the wild animals and even if Manikandan returned without bringing the tigress' milk, the King's love for him would not be as before. The Queen, became a prey to the Diwan's plot and agreed to do what he told, so that her son could succeed the King to the throne. The Queen, as told by the Diwan, cried out loudly that she was suffering from severe headache and stomach pain and the King, believing this, called the Diwan to bring in the best physicians to treat her. The Physician, brought by the Diwan examined the Queen and told the King that the Queen had been suffering from a dangerous disease and it could be cured only by applying Tigress' milk .The King sent several of his men to the forest for bringing this milk. The King understood that it was an impossible task and wanted his dear Queen to be cured at any cost and offered half of his Kingdom to anybody who brought the Milk. When the King was thinking about this, Manikandan asked him to let him go to the forest promising to bring the milk. However, the King told him that he was awaiting to be crowned to the throne that he was also not of age and hence refused to let him go. Manikandan told the King, in spite of his refusal, he had to go lest he would be cursed for not curing the Queen. Since the King persisted in his refusal Manikandan wanted the King to promise to do something he wanted. The King gave the promise and asked him what he wanted and immediately Manikandan asked the King to permit to go to the Forest. The King felt disappointed that he had been tricked and with no other alternative permitted Manikandan to go to the forest. At the end, of the battle between Mahishi and Manikandan at Azhutha River banks, Manikandan climbed up on her chest and danced violently. The impact of his dance was felt on the Earth and Devloka and the Devas were afraid. 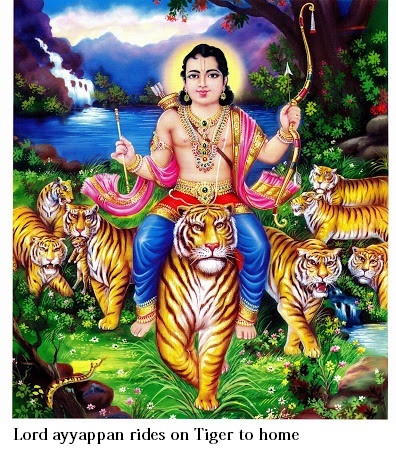 After killing Mahishi, Manikandan went to the forest for the tigress milk, when Lord Shiva appeared before him and told him that though he had done good for the Devas, still there was one main task and that was to give comfort to the King Rajasekara who was very concerned about him. Lord Shiva further told him that he could go to the Palace with Lord Devendran in the form of a tiger. With Manikandan on the tiger, all female devas in the disguise of a tigress and male Devas, as tigers started their journey to the Palace. When Manikandan, with the tigers, approached the Palace, the people who ridiculed him when the started his journey to forest whether he wanted a toy tigresses, really got panicky seeing the violent bunch of animals and started running helter skelter.